Can We Talk About Bedwetting? Like, really. I mean, I think it’s safe to say we’ve all had experience with it at one point or another. Dealing with bedwetting as a parent is a chapter of its own. But what do you do when that chapter never seems to end? All of my kids have woken up, at one point or another, soaked. I've invested in mattress pads, really heavy-duty ones, which, let’s be honest, only made more laundry for me. But one of my kids (I won’t mention their name) hasn’t completely stopped. On this kid’s bed, they’ve worn out those (expensive!) mattress pads, having gone through (read: completely shredded from washing so often) THREE. A little over a year ago I knew I needed to do something different. This kid is toilet trained-- they go to school and don’t have a problem during the day-- but in the morning, we were dealing with a wet bed more often than not. Reverting to diapers wasn’t an option, this kid isn’t a baby. I went to the store and found a solution in Pampers Underjams or, as they’re known in our home, Jammers. At first my kid was hesitant, asked if I was holding diapers. I explained, nope, Jammers are for Big Kids who are doing their best to stay dry at night, even if they sometimes wake up wet. I let my kid weigh in on the decision, which I think made them feel empowered. It became a Cool Thing, that this kid got to wear Jammers at night (Jammers & Jammies). Waking up with a wet Jammer meant, “Shoot, we’ll try again tomorrow,” but also no more everyday bedding laundry! And waking up with a dry Jammer? Everybody wins. Sometimes when I’d mention to my friends that we had a bed-wetting issue at our home, the term enuresis would come up. 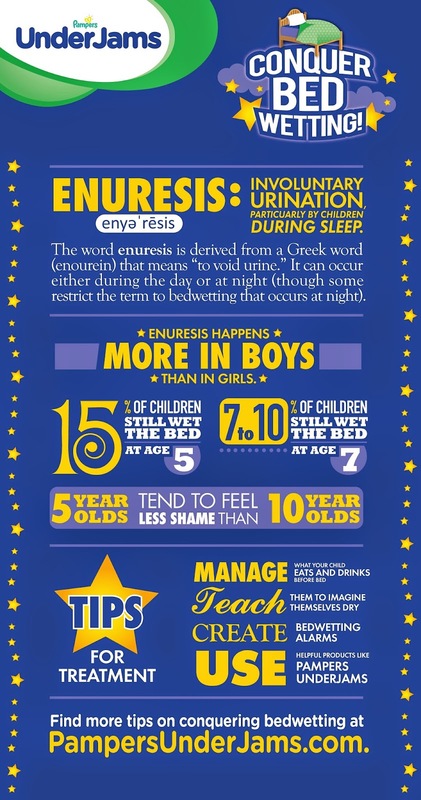 Enuresis is simply involuntary urination, particularly by children, during sleep. It happens more in boys than in girls. I wish I would have had Pampers Underjams for all of my kids while they transitioned to being able to consistently stay dry at night. Underjams have night wear leakage protection that features a NightLock ultra-absorbent core. Plus, they’re made of ComfortWear, which is like cloth instead of plastic you might find on diapers, and the low waist band helps kids feel at-ease that no one will be able to see that they’re wearing them. My dear parent friends, if you’re dealing with enuresis, know you’re not alone. And know that Pampers Underjams have helped my family, and many others, deal with the transition. Please join the conversation and help other parents know they're not alone in this by using @Pampers and #ConquerBedWetting. You can learn more about enuresis at PampersUnderJams.com. Oh how I wish this wasn't a post that I understand from experience. Glad you found something that works!